Culter Theatre Club needs you! 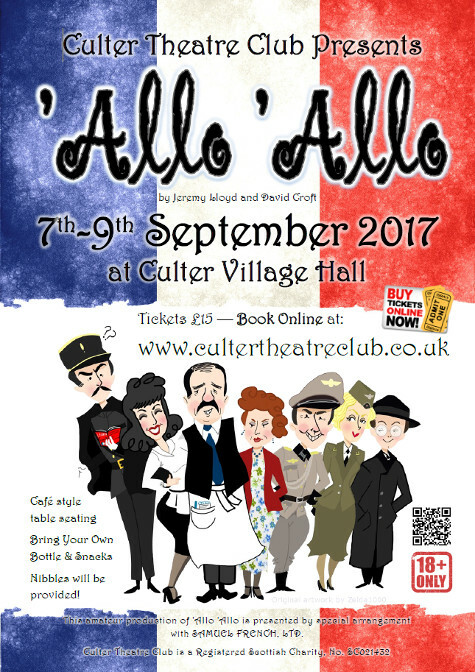 Culter Theatre Club has a busy schedule this year with another run of the very popular “Allo Allo” on the 7-9th of September, tickets are available on-line this year, and details can be found on our website and Facebook pages. Straight after, we will be working hard on our annual pantomime, which this year is “Snow White”, keep a look out for our audition notices around August this year. To do all of this we need a great cast, director, producers, musical director, choreographer, stage crew, dress makers, make up artists, lighting and sound technicians, set builders and painters, prop makers, stage mangers etc. For all the people you see on stage, there are just as many back stage and behind the scenes, each one playing a vital role in each production. Every year we get a lot of people auditioning to be on stage, far to many to give everyone a role, however we only get a few people coming forward that want to help backstage. With the natural progression of people through the club we always find ourselves with plenty of cast but not enough people willing to direct, produce, choreograph and all the other roles the club needs to continue putting on the productions of the quality we are so famous for. It is now getting to a stage where we are finding it very hard to put on productions. We have a brilliant cast, a magnificent stage, state of the art lighting, sound and projection facilities. We play to 1200 people every year for the Panto, hopefully some of those people can help us. We urgently need some brilliant Directors, Producers, Choreographers, Musical Directors and all those other vital roles if we are to continue to function as a club. If you want to help, or know someone that can, please get in touch with me for an informal chat, I’m happy to show you the facilities we have. Neverland Never Seemed So Good! Well that's panto over for another year, and a huge well done to all the cast, crew and band! Another brilliant show enjoyed by over a thousand people over the five nights. Like us on facebook or sign up to our mailing list on the website here to keep up-to-date with our next productions and events!